Mellow Monk's Green Tea Blog: Yosakoi! Yosakoi is a style of Japanese festival dancing performed during the season of Obon. "Yosakoi" literally means "Come at night" in the Tosa dialect of Japanese, which is spoken in what is today known as Kochi Prefecture, on the island of Shikoku. Yosakoi began in 1954 as a modern version of the centuries-old Awadori dance style, which originated in neighborning Tokushima Prefecture ("Awa" is the old name for Tokushima), so you could say that Yosakoi is a modern, "citified" (but still very Japanese) version of a traditional rural dance. 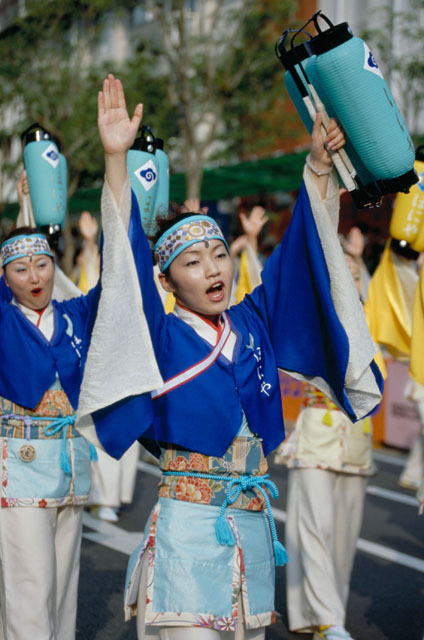 After its inception, Yosakoi gradually spread throughout Japan, and today there is even a Yosakoi festival held in Tokyo's über-trendy Harajuku district. The historical Tosa area is significant as the birthplace of Sakamoto Ryoma, a hero of the Meiji Restoration. His statue is prominently displayed at Katsurahama beach, near the Sakamoto Ryoma Memorial Museum. From the 51st Yosakoi festival in 2004 in Kochi.